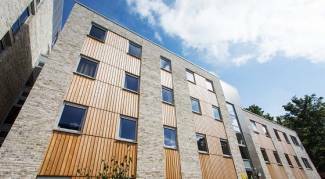 Ogilvie Construction was appointed as main contractor for Crosslane Student Developments, in partnership with the Unite UK Student Accommodation Fund (USAF), to construct a new purpose built 235-bed student development. As specialists in student residential, Ogilvie were tasked with developing the site of The Old Printworks into modern student accommodation comprising of 44 studios and 191 bedrooms in cluster flats, as well as facilities including a gym, common room, study room, laundry, cycle storage, bin storage and some disabled parking. 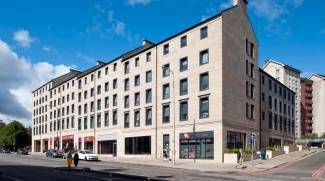 This tight city centre site was in the centre of Edinburgh surrounded on 3 sides by residential properties, just a short walk from the Royal Mile and the student hub. This logistically challenging project is six -storey high and will accommodate some of the city’s 50,000 full time students. The main building is a reinforced concrete frame with 2 staircases and 2 lift cores. The foundations were mass filled concrete with waterproof tanking. The frame is infilled with lightweight metsec cladding and cement board with insulation and then a range of external cladding including stonework, brickwork, timber rainscreen, metal rainscreen, curtain walling and windows. The 2 smaller studio blocks to the rear of the development have similar foundation but the frame constructed in pre-fabricated lightweight metsec panels and composite in-situ concrete decks. These buildings are also clad in insulation, brickwork and timber rainscreen. All roofs are covered with a single ply membrane and the lower levels all have a Sedum roofing covering to give a softer impact to the surrounding neighbours and the environment. Pre-fabricated bathroom pods for each bedroom were delivered and installed floor by floor as the build progressed. The main interior is formed using drylining, ames taped and decorated with wash down paint. Pre-fabricated furniture was also installed to each bedroom and kitchen for the students. 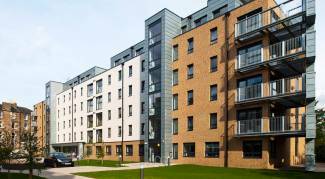 Gas fired central heating with a CHP engine and centralised boilers heat the whole development. Each flat and studio has its own mechanical and electrical controls. Solid timber doors with a combination of vinyl and carpet flooring give a clean homely environment. A courtyard area to the rear of the building has been formed in both soft and hard landscaping giving the students a further pleasant outdoor amenity space.